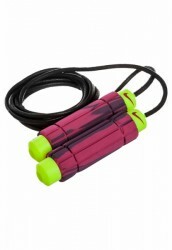 The Nike jump rope Weighted Rope 2.0 is ideal for an effective whole body workout thanks to its high-quality workmanship. The heavy handles ensure a more intensive training due to their additional weight. The soft, ergonomically shaped handles are comfortable in the hand. The length of the modern jump rope 2.0 of Nike is easy to adjust and is suitable for a user height of up to 1.98 m.